4-time AMA ProStar Pro Streetbike National Champion Kent Stotz and his HRCA-backed Stotz Racing team. Mark dyno-tunes Kent's Honda CBR1000RR and is also crew chief for the Stotz Racing team. Kent was the first Streetbike 200-mph record holder. Kent also had the first streetbike to go over 500 horsepower, reaching 505hp in a Horsepower Shoot-out. Team Arrow's World's Fastest 500cc motorcycle ridden by Gary Hensley. Mark dyno-tunes this Honda for Team Arrow. At the Bonneville Salt Flats Team Arrow set the record for the fastest one mile average of 228.58 mph on August 18, 2006. AMA Pro Flat Track racer for Lloyd Brothers Motorsports, Inc. / Team Aprilia USA Henry (Hank) Wiles. Henry is only the fifth rider in history to have back-to-back wins at the Peoria (IL) TT track. 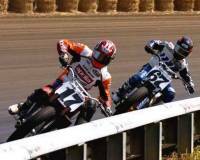 Henry has also been on the podium for races such as Daytona and the Springfield Mile.